Have you heard of the Ontario Climate Change Action Plan (CCAP)? The CCAP is "Ontario's five year plan to fight climate change, reduce greenhouse gas pollution and transition to a low-carbon economy." If you plan to buy or sell a house in the next several years, there is an action plan that will likely affect you. The good news: it benefits both the seller and the homebuyer. Starting January 1, 2019, all single-family homes that are listed for sale must undergo an energy audit. The energy rating given to the home will be included in the real estate listing. The Home Energy Rating and Disclosure (HER&D) program will help homebuyers compare houses based on energy consumption, so they will know what to expect for heating and cooling bills when they move in. Sellers will receive the energy audits for free, and will be able to take advantage of retrofit incentive programs to make their house more energy efficient for the next* owner. 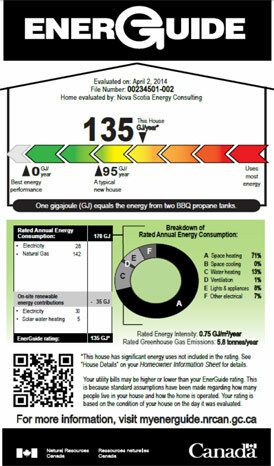 Energy audits are performed by an energy advisor certified by Natural Resources Canada (NR Can). Only fully-trained energy advisors are qualified to conduct the energy audit. Tools and equipment are used to find air leakages, insulation issues and analyse the effectiveness of your heating and cooling equipment along with your ventilation system. The home is then given an energy rating, and the results given to you in a way that you can easily understand. Energy ratings are important to you and your home. It signifies the amount of energy that your home, or future home, will be consuming. Less is more. Owning a home that consumes less energy is better for your bank account and for the environment. Less money will be spent on heating and cooling and less natural resources will be spent heating and cooling your home. 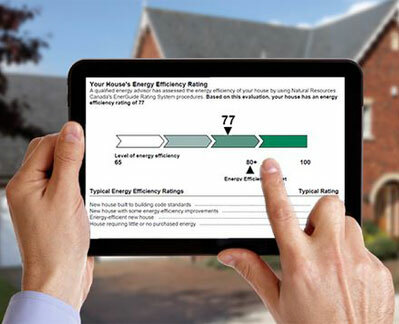 Starting in 2017, the energy ratings you receive will use the updated EnerGuide Rating System. The number shown will tell you how much energy in GJ/year is being consumed. You can easily apply this to your current hydro rate to know how much you will likely be spending in the course of a year. In addition to energy consumption, the new version also gives you a detailed report of where your home is leaking or consuming more energy. This allows you to know exactly where you should invest in retrofits, and will help you determine what rebates and grants you qualify for. Finally, you can compare the home to a "reference house" and to other homes on the real estate listings (in 2019). Comparing the home to a "reference house" allows you to know what other houses similar to the one you are looking at should consume. Myth #1: Homeowners will have to pay for energy audits at their own expense. Fact: The Government of Ontario is already setting aside money in the Green Investment Fund to pay for energy audits. Myth #2: Homeowners will have to pay to retrofit their homes to compete with others on the market. Fact: The money put into the Green Investment Fund will also go toward paying expenses for retrofits. Although 100% of the retrofits will not be covered every time if more work is required, it will cover enough for a home to compete against other homes in the same market. Myth #3: There is no way to prepare for the coming changes, which means homes with lower energy ratings will lose equity. Fact: Homeowners can already take advantage ofthe Green Investment Fund through rebates with Union Gas regardless of whether or not they are selling their homes. When energy audits for homes being sold becomes mandatory, new incentives will be available. Myth #4: Homes with lower energy ratings will be harder to sell than homes with higher energy ratings. Fact: Homes with higher energy ratings will be higher in demand, but homeowners will be able to retrofit their homes using grants and rebates. Still, not everyone is going to opt for homes with higher energy ratings. Homes in other locations with similar regulations sell regardless of high or low energy ratings. Myth #5: ENERGY STAR ratings will become meaningless. Fact: Energy Star for New Homes certification and new ENERGY STAR products will complement the EnerGuide Rating, and will help ensure homeowners that their homes are performing better already. Myth #6: Mandatory energy ratings will hurt the housing industry. Fact: Ontarians already spend over $26 billion per year on renovations. HER&D will urge homeowners to spend this money on energy conservation retrofits instead, and will be introducing more money into the housing industry through the Green Investment Fund. This will lead to an increase in job creation. Myth #7: Homeowners will lose privacy because the ratings are posted publicly. Fact: The only information that is presented publicly is the rating and how the home compares to others similar to it. There is no personal information that that the homeowner should fear others seeing. Myth #8: Home inspections arejust as good, if not better than an energy audit. Fact: Home inspections and energy audits are two very different assessments. Energy advisors must be certified by NR Can, which includes training on procedures to perform the audit. The tools and methods used during an energy audit will find leakages that a normal home inspection will not. Myth #9: Energy ratings don't tell the whole story, especially when it comes to where money and energy can be saved. Fact: Right now, many homebuyers rely on viewing past bills ofthe current homeowner. However, this is unreliable because they may have a radically different lifestyle, or even be lying about the numbers. The new NR Can EnerGuide Rating System will give more information on where leakages are and how you can prevent them.